The final round of the inaugural A1GP series saw wins for Alex Yoong (in the sprint race - on the podium afterwards, right) and Tomas Enge (in the feature event). Alex Yoong won the sprint race from pole position, while Tomas Enge's Czech team took advantage of an early safety car period in the feature race to pit early, re-appear behind Yoong, then sweep past into the lead - never to be headed throughout the rest of the race. 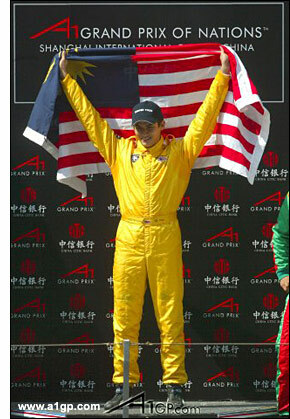 We know where Alex Yoong is heading next - to Istanbul, to race the Racing for Holland Dome.